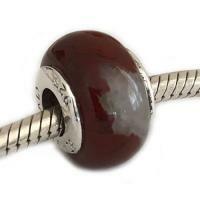 Beautiful Carlo Biagi Beads in stone or wood are high quality .925 Sterling Silver. Unique and luxurious beads to enhance and customize charm bracelets. Will fit on P-aNDORA as well as Chamilia, Trollbeads bracelets and more. Sample display bead - Price Reduced! SKU B-BSP-01Reg. Price $18.00 $9.00 On Sale! SKU B-BSRS-03Reg. Price $17.00 $8.50 On Sale! SKU B-BSSP-01Reg. Price $18.00 $9.00 On Sale! SKU B-BSSP-02RBReg. Price $18.00 $9.00 On Sale! 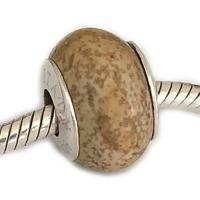 Stone charm bead - Only one available! SKU B-BSSP-07Reg. Price $18.00 $9.00 On Sale! SKU B-BSSP-09Reg. Price $18.00 $9.00 On Sale! SKU B-BSSPS-01Reg. Price $20.00 $10.00 On Sale! SKU B-BSSPS-03Reg. Price $20.00 $10.00 On Sale! SKU B-BSSPS-04Reg. Price $20.00 $10.00 On Sale! SKU B-BSSPS-05Reg. Price $20.00 $10.00 On Sale! SKU B-BST-04Reg. Price $24.00 $12.00 On Sale!